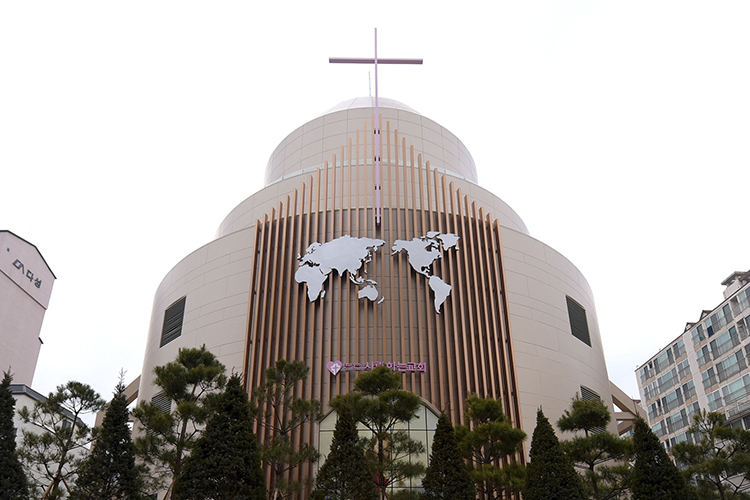 After outgrowing their current facility in Seoul, South Korea, the Beloved Church (formerly Great Faith Church) community set out to repurpose what used to be a gym complex in the same city. This new, 2,500-seat, 11,305ft2 space was beautifully renovated into an architecturally stunning worship facility. 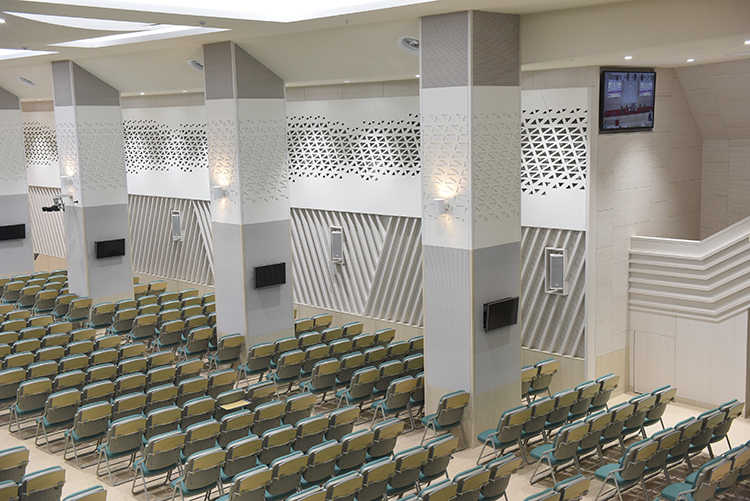 The church planned to do more with their new space by increasing worship events during services and installing two new, professional sound systems in order to provide even sound coverage to all churchgoers, high and even SPL, and superb clarity in both the main and auxiliary chapel. After listening to numerous product demonstrations from various major speaker brands, Beloved Church chose to purchase and install Clair Brothers products. 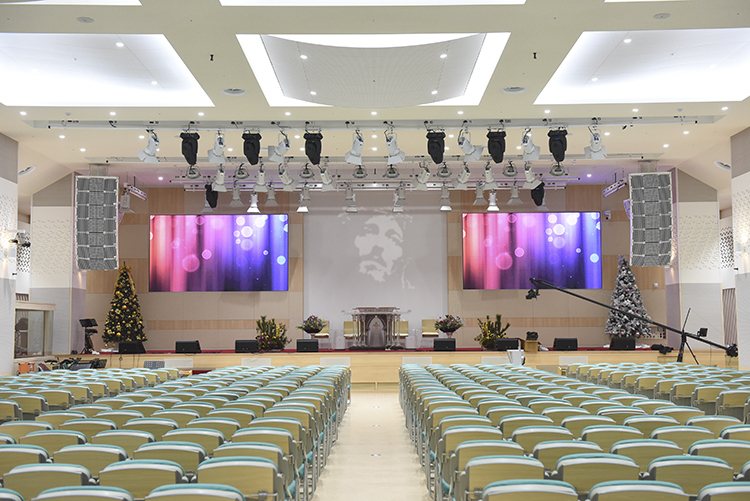 Seong Keun Ahn, Product Specialist and Application Engineer for Clair Brothers Korea carefully designed a system well-suited to Beloved Church’s sonic requirements, and Fone Sound of Korea expertly installed the new CB system. The main chapel’s PA consists of 14x i212-i with 4 USLP under stage subwoofers providing low end. The USLP design was perfect for the low stage height. Additionally, 2x CS18-II subwoofers were positioned in the back of the room in order to cancel excess low energy and possible standing waves. The new monitoring system consists of not only stage monitors – 4x 12AM and 6x WEDGE-P -, but also a hanging stage fill systems of 8x i208-i aimed at the pastor and worship leader. This combination results in clear and coherent present sound. 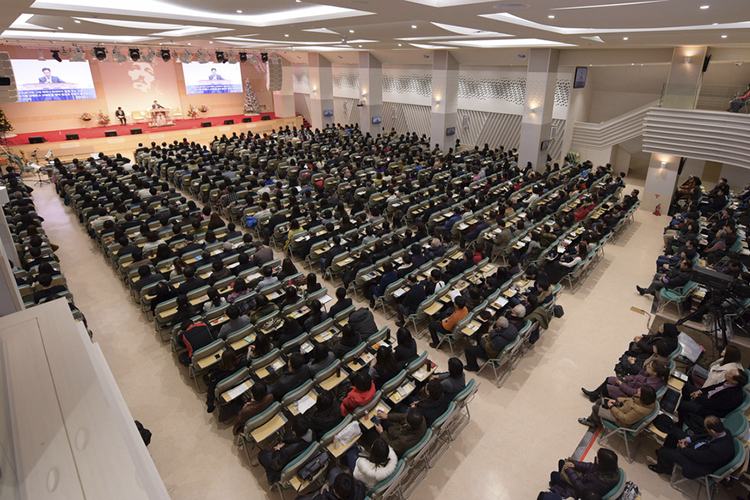 The sanctuary’s shape was not ideal for speaker coverage especially because of its relatively low ceilings and long, deep balcony (66ft). The team at Clair Brothers utilized a number of versatile Clair products in order to fully cover the space so that every person could hear the pastor’s message. Clair Brothers designers recommended three rows of delays for both under balcony and upper balcony comprised of 32 Clair Brothers IRIS-II-P in total. These speakers were perfectly suited because of their shape, appearance and sound quality. In addition, 14x FF2-HP speakers were used for side and front fills. The entire system is powered by 21 CB-PLM12K44 amplifiers and one CB-PLM20K44 amp. The auxiliary chapel’s system features an equally high-performance system appropriately scaled to the space. This consists of 4x CAT115 and 2x CS218 for the main PA, 2x CS18-II for delay subs, 2x RC80 boxes for front fill, 4x kiT12 for delays, 2x FF2-HP for stage fill and 6x WEDGE-P for stage monitoring. The auxiliary chapel’s system is powered by 2xCBPLM20K44 and 3x CB-QSC-PLD4.5.